Our vision is a future where the wellbeing of people and communities improves every year. 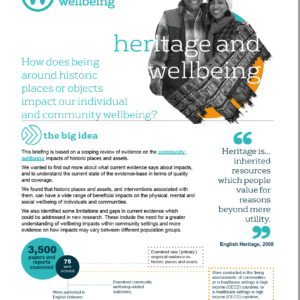 We believe that improving wellbeing should be the ultimate objective of policy and community action. Our mission is to develop and share robust, accessible and useful evidence that governments, businesses, communities and people use to improve wellbeing across the UK. Our approach is independent, evidence based, collaborative, practical, open and iterative. What’s a What Works Centre? The What Works Centre for Wellbeing is part of the What Works Centre network. A What Works Centre is a bridge between knowledge and action for decision-makers. We bring together the evidence about the relative impacts on wellbeing of policies and projects, their cost and the quality of the evidence. 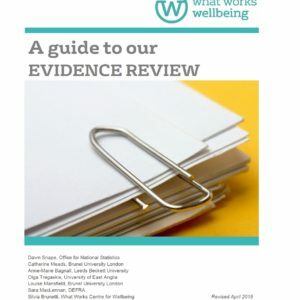 The evidence programmes have been commissioned by the Economic and Social Research Council on behalf the What Works Centre for Wellbeing. The Centre also has a role to support the development of the evidence base. A What Works Centre is independent of government with a clear and relevant policy and delivery focus.